While many UAV operations could be conducted under Part 101, in the new Health & Safety environment many local Councils and major businesses are now requiring Part 102 certification as evidence that they are dealing with a competent operator. Aviation Safety Management Systems Ltd (ASMS) specialises in operator certification for all forms of aviation, and can assist with your needs. ASMS have prepared expositions for UAV operators ranging from simple to complex. For a small organisation the exposition will include all the systems you may require, and for large organisations the exposition can be integrated with your existing organisational systems. Our expositions are designed to aid compliance with the Health and Safety at Work Act 2015 as well as with the civil aviation regulations. To be granted the privilege to operate outside the restrictions of any rule of Part 101 you must have a written exposition that describes the procedures that you follow, and those procedures must result in an acceptable level of safety. CAA will assess your exposition and grant certification if they are satisfied with the procedures that you propose. ASMS can assist you with the preparation of your operating manuals and application to CAA for certification under Part 102. 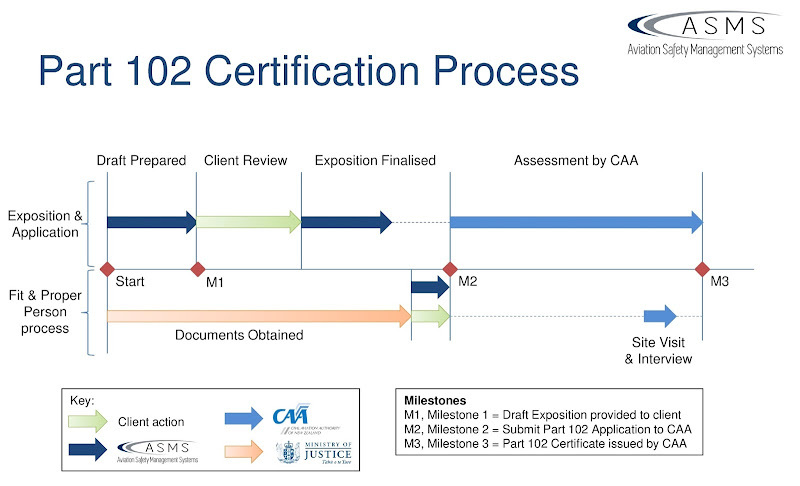 The Part 102 certification process is summarised in the diagram on the right (click to expand). There are two parallel processes: preparation of the exposition, and obtaining the documents required for CAA's "Fit and Proper Person" assessment. We will discuss your requirements with you and then prepare a written proposal. Once you have accepted our proposal we will send you a set of questions with information we need to prepare the exposition. We will then prepare a draft and send it to you for your review. It is usually appropriate to meet with you to talk through the requirements in the draft and any questions you may have. Based on your feedback we will then finalise the exposition and the associated “rule compliance matrices” published by CAA. 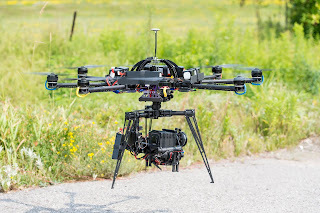 The CAA requires that there is a person with primary responsibility for the UAS operations. We will guide you through the collection and preparation of the documents for the "Fit and Proper Person" process undertaken by CAA. This process requires the applicant to apply for a Criminal Record History from the Ministry of Justice, as well as a demerit point and traffic offence history. There are also specific requirements around documents for proof of identity and proof of address for service. 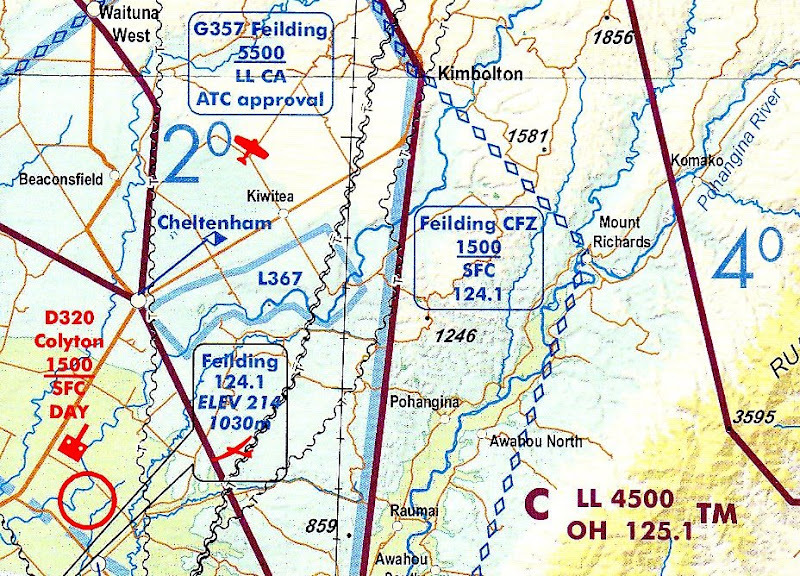 Under New Zealand's Civil Aviation Rules a pilot qualification issued by an approved organisation is essential for flying within 4km of an aerodrome under the Part 101 rules, and CAA requires a UAV pilot to hold an appropriate pilot qualification to be able to exercise the privileges granted under a Part 102 certificate. This means that both the organisation and the pilot require certification to conduct operations under Part 102, even if the organisation is a sole-trader who is also the pilot. The reason for this is that Part 102 certification ensures that the organisation has the appropriate procedures in place, and pilot qualification ensures that the pilot has the required knowledge and skills to be operate safely using those procedures. ASMS is an approved Part 141 certified Aviation Training Organisation. Our UAS Pilot Certificate meets CAA's requirements. If you require both pilot certification and Part 102 certification email us to discuss a package to suit your needs.